But I couldn’t find one, so I decided to write it myself. I hope these Q&As help anyone just getting started in white papers. Or anyone who wants to understand them better. Click any topic to see related questions and answers. Are there any industry standards for these? Aren’t there at least some conventions? What different types of white papers exist? When is each type of white paper most useful? What’s NOT a white paper? White papers and blog posts: What’s the difference? 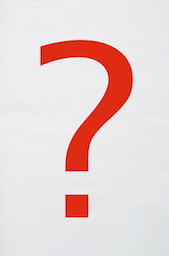 White papers and brochures: What’s the diff? White papers and case studies: What’s the diff? White papers and e-books: What’s the diff? White papers and press releases: What’s the diff? When do people read white papers? How do people read white papers? Why do companies produce them? Where do white papers fit in the sales cycle? 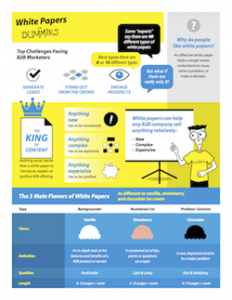 Which type of white paper should your firm create? How much does a white paper cost? How long does a white paper take? How do you promote a white paper? What kind of companies need white papers? How hard is it to write a white paper? How long does it take to write a white paper? How much can you charge to write a white paper? What main problems do white paper writers encounter? How can you learn more about white papers? Where did white papers come from? Where are white papers today? Where are white papers going in the future? Ask any 10 people this question, and you’ll likely get 12 different answers. Clearly none of these exotic definitions do the trick. The content of a white paper provides useful information for business people seeking to understand an issue, solve a problem, or make a decision. The format of a white paper is somewhere between a technical manual and a glossy brochure… between a dry-as-dust academic paper and an annual report. Are there any industry standards for these documents? In a word, no. Anyone can call anything a white paper. And they do. The typical white paper looks better than a technical manual, but not as slick as a brochure or ad. But some white papers are as colorful as a cereal box. The typical white paper is distributed as a PDF on the web. But some are still printed out for sales calls, press kits and trade shows. If there’s no standards, aren’t there at least some conventions? If a document has all these characteristics, it’s probably a white paper. White papers come in many different types, with no accepted system for labeling them precisely. This yields five main flavors of white papers. You can’t effectively combine all three, because of the different viewpoints of a problem/solution and a backgrounder. A problem/solution is like looking at the wide view of a whole industry with a telescope. A backgrounder is like zooming in on one specific offering with a microscope. It’s very difficult to do both in the same piece. But all these descriptive terms fit under one or another of the three main types, so they’re not as helpful. Each type is most appropriate for delivering certain information to a certain audience, as shown below. For shorthand, I’ve used “offering” to represent any product, service, technology or methodology described in the white paper. Remember that there are no “rules” or universal standards for what makes a white paper… so many people use this label very carelessly. By my definition, a problem/solution white paper contains useful information to help people understand some relatively new, complex or expensive offering they are considering buying for their business. There are many other types of useful information, but I don’t consider them white papers. But notice how many of these items are actually documentation used after a purchase when installing, learning or troubleshooting a system. Those may be useful, but they’re not white papers. To my thinking, a white paper is strictly a pre-sales document used before a purchase. It’s not documentation or support, it’s sales and marketing. White papers and blog posts are usually quite simple to tell apart. White papers are usually PDF downloads of 3,000 to 5,000 words. A good white paper is based on established facts and logical arguments, like a well-researched article in an industry journal. A white paper generally takes 4 to 6 weeks of intense effort by a group of people. That’s why an effective white paper can be used for one or two years, and then refreshed. Blog posts are usually webpages, much shorter at 500 to 1,000 words. A blog post can be generated in a couple of hours. A blog post can be sheer opinion, or even a rant, more like a letter to the editor. That’s why there are so many blogs: Anyone can shoot off their mouth in a blog. That’s why most blog posts are relevant for only a few months. In a way, blog posts are a good place to test out your ideas, as they come together. You can gather comments and feedback, and see how your online audience connects with your ideas. Then you can solidify and back up your ideas in a white paper where you can pour more time and effort into the research, writing, design, and promotion. White papers and brochures: What’s the difference? White papers and brochures are almost complete opposites. Brochures are sales documents intended to create interest and desire. Brochures push “emotional buttons” such as fear, greed, envy or vanity. They are generally colorful, flashy and filled with promises. They use the techniques of copywriting and advertising. White papers, on the other hand, are persuasive essays about a certain product, service, technology or methodology. White papers appeal more to logic through irrefutable facts, iron-clad logic, impeccable statistics and quotes from industry opinion-makers. They are generally plain-looking, not flashy and filled with facts. They use the techniques of rhetoric and plain English. Some companies simply reformat a brochure and call the result a “white paper.” This is a dangerous waste of effort. Most readers become irritated when they discover that a vendor has done this. I have heard people urge vendors to make their white papers as flashy as brochures. This is not correct. A white paper should be much more dignified, substantial and informative than a brochure. Making it look like a sales piece is the kiss of death for a white paper. White papers and case studies: What’s the difference? White papers sometimes mention case studies for evidence of a vendor’s claims. But the two are quite different in form and content. Case studies are extended testimonials on how a product or service helped someone in the real world. They are typically between 500 and 1,500 words long, written in a journalistic style with many quotes from the actual customer. Before we had this terrible problem, then we found this fantastic product, and After we started using it, everything was sweetness and light. They are generally 2,500 words or more, written in a somewhat academic style, with no direct quotes from the vendor’s representatives. A white paper may be told in the Problem/Solution format, but rarely in the Before/After format. White papers tend to be used earlier in the sales cycle, to help prospects visualize a possible solution to a nagging problem. Case studies tend to be used later in the sales cycle to reassure a prospect that other buyers benefited from the same approach they are considering. White papers and e-books: What’s the difference? Remember, we’re not talking about an electronic book intended to be read on an e-reader or smartphone. We’re talking abut e-books used in B2B content marketing. That type of e-book and a white paper can be hard to tell apart. You can often call the same document a white paper or an e-book. A B2B e-book can be just about any length on just about any topic. Many e-books look more like slide decks than text-driven documents. In fact, some say e-books are just prettied-up white papers turned on their sides. They may be young, or on the road. An e-book may sound like more fun than a white paper that sounds like a lot of work. If you’re trying to break through the noise of competing white papers, an e-book might sound different enough to be engaging. You could gain more traction by presenting the same content as an e-book instead of a white paper. Just remember: The goal is the same. An ideal e-book—just like an ideal white paper—will help your target audience understand an issue, solve a problem, or make a decision. If your content does that, you can call it an e-book, a white paper, or whatever… and your audience will still thank you for it. White papers and press releases: What’s the difference? Press releases are short, factual announcements of interest to a certain audience. This format has existed for perhaps 100 years. Until recently, press releases were used to influence media “gatekeepers” and gain publicity for their sponsor. The most effective press releases were recycled by journalists into printed articles. Today, press releases are available to anyone on the Web, without the need for any gatekeeper. A contemporary press release must be highly factual. In fact, there are rules about what a public company can say in a press release. Problem/solution white papers have existed for perhaps 50 years and the format has evolved quickly since the turn of the century. While a white paper is sponsored by a company—the same as a press release —white papers are generally much longer than press releases, with more room to present facts and develop arguments. White papers are sometimes packaged with press releases as a “press kit.” And they are sometimes republished in trade magazines as articles. On the Web, white papers are available to almost everyone. There are no legal limits on what a company can say in a white paper. But it’s best to take a journalistic approach, backing up every assertion with statistics, facts and quotes from respected source. White papers are read by almost anyone contemplating the purchase of a relatively new, relatively complex, or relatively high-priced product or service for their business. In larger companies, all these people may sit together on a selection committee that makes a collective decision. In smaller firms, some people may wear several of these hats and meet informally to discuss their purchase. White papers are especially well-read by IT managers. One survey showed that they read a median of 30 white papers a year, with some reading more than 50 a year… that’s one a week! As well, business people routinely passes good white papers up and down the chain of command, to both their managers and their staff. White paper readers are seeking useful information to help them understand an issue or solve a problem. This often involves learning about the business benefits or technical details of a product or service they are considering buying. Develop a short list of qualified vendors (33%). White papers used to be aimed strictly at IT professionals. Today, many less technical people are involved in big buying decisions. These people are seeking plain-language explanations with clear business benefits, backed up by convincing facts and arguments. Make up a short list of qualified vendors. Executives at the IT portal KnowledgeStorm encourage clients to think of a technology sale in four phases. 1. Vision: a business person is imagining how to solve a problem. At that point, a high-level white paper focused on business benefits can help them visualize the possibilities of using a certain offering. 2. Planning: a prospect is trying to map a set of functional requirements to a certain product. That’s when a more detailed, technical white paper can help them understand how a given solution would work in their environment. 3. Evaluation: a prospect is actively looking at a set of products from a short list of vendors. The need for white papers has pretty much passed. An Evaluator’s Guide for a complex product might be helpful at this point. But more often, prospects want the reassurance of seeing case studies from other customers. 4. Acquisition: a customer is actually purchasing and installing a product. They may need added information to help them do so, but it’s more accurate to call this “documentation” rather than a white paper. After all, the white paper has already played its role and the sale has already been made. Everything from this point on is after-sales support. Almost everyone working today has more to read, more to remember and more to do than they can possibly get to. For example, one study showed that the typical manager has more than 50 hours of work sitting on their desk at any point. They’re not exactly waiting for another document to add to the pile?! No one reads white papers for fun; they read them for work. So most people who read white papers do not read the same way they might read a novel, paying attention to every sentence. Instead, they tend to skim, scan and skip… especially if they’re reading off the screen. Don’t you? This means that white papers must be carefully written and designed for business readers with limited time and attention. A wall of gray text is not likely to engage today’s white paper reader. White papers need to use visual breakers like sidebars, callouts, headings, lines, boxes, bullets and graphics to direct the attention of scanners and skimmers. These visuals need to point out the key messages of the document in a way that’s easy for today’s busy readers to follow. Good news: There’s a whole book devoted to this subject. Jonathan Kantor has written an excellent guide called Crafting White Paper 2.0: Designing Information for Today’s Time and Attention Challenged Business Reader. Here is my mini-review of this book. Here’s where to find more details or order your own copy. Highly recommended. White papers abound in the technology sector, where they are commonly used to explain software and hardware products. But there’s no reason why white papers can’t be written about many other B2B offerings. Any B2B vendor selling anything relatively new, relatively complex or relatively expensive could likely benefit from a white paper. This adds up to perhaps half a million potential vendors in the English-speaking world that could benefit from white papers. Vendors of any relatively familiar, simple and inexpensive B2C products don’t often publish white papers, since there is little need for them. After all, most consumers don’t want to read a 10-page document before they buy something. There may be exceptions—especially in energy and health care—where consumers may have to make significant decisions. Why do companies produce white papers? This model acknowledges that skeptical prospects are hungry for a vendor who will serve as a trusted advisor, not just a peddler of their wares. A white paper can serve this purpose remarkably well. Remember, the most effective white papers provide useful information to help a reader understand an issue or solve a problem… not just background about a product. The longer the sales cycle–aka the customer journey–the more likely white papers are part of it. White papers are used early in the sales cycle, before the prospect makes a purchase. These can be called the “Vision” or “Planning” stages of the buying process, or the “Research” or “Selection” tasks of the Universal Tasks. After making a purchase, the buyer has little need for white papers. At this point, the customer needs documentation, training and technical support, not white papers. If you are creating a white paper, but aren’t sure which flavor is best, you can narrow down the list with three straightforward questions. #1: What is the purpose of this paper? The best flavor to generate leads at the top of the funnel is a problem/solution or a numbered list+problem/solution. In general, the best flavor to attract attention, cast Fear, Uncertainty and Doubt (FUD) on competitors, or nurture a prospect through a complex sale is a numbered list. The best flavor to influence a selection committee at the bottom of the funnel is a backgrounder. 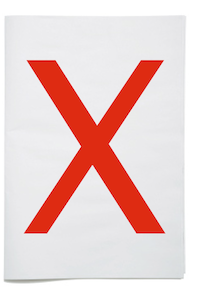 #2: When will this white paper be used? Early in the sales cycle, your white paper can be more high-level and general. Later on, your white paper should be more detailed and specific. #3: Who is the audience? What do they want? IT people generally want to see technical details. They will tolerate longer papers with modest production values. In fact, a slick and colorful format tends to make them suspicious. Executives want to see bottom-line benefits summed up in a page or two. They want to hear about lower costs, better sales, higher profits or improved customer service. Executives expect polished production, with clear graphics they can understand at a glance. Managers want to hear about streamlined workflow and labor savings. They are keen to see how a new system would affect their area and their people. User reps want to hear about ease-of-use, training and support. They can be more or less technical, but they will likely be detail-oriented. Users are not often a significant audience for white papers. But if a user rep is involved in a selection committee, you need to address their concerns at some point. A mixed audience or selection committee may want to hear everything touched on above. In this case, you may need several white papers, each with a different flavor and each with content geared to a somewhat different audience. Each of these costs can be outsourced, or handled in-house. In 2013, extensive research for my book White Papers For Dummies showed that the average fee for a text-only white paper was $4,200. Most B2B marketers count on spending $5000 to $7,000 for the text, and another $1,500 for design and graphics. Translating and promoting are further costs. And there are “soft costs” in terms of the time it takes your subject matter experts to answer interview questions and e-mails and to review drafts. All this to say, a white paper is a significant project in any marketing budget. Trying to do a white paper on a tiny budget will not yield best results. After working on 273 white papers, in my experience it takes 6 to 8 weeks to get from the first planning interview to an approved white paper draft. And it can take longer if people travel a lot or take their time with reviews. Illustration and design take an additional week or two. Translations, if required, take more time. And then the promotions begin and run for many weeks or months. The good news is that a vendor can often continue to use the same white paper for years. This long life helps to achieve a very positive return on the investment in a white paper. Simply writing a good white paper is not enough. Tucking it away on a website is not enough. To earn an acceptable ROI, a vendor must actively promote a white paper in many ways. In fact, the best way to promote a white paper is to handle it as a mini-product launch. Do everything you would do to launch a new product, and your white paper will be on the road to success. The more effort you invest in promoting a white paper, the more likely it will succeed. See my article on the 18 must-do tactics to promote any white paper. Remember, a white paper is a pre-sales document intended to attract prospects or explain an offering. Any B2B vendor selling anything relatively new, relatively complex or relatively costly could likely benefit from a white paper. Writing your very first white paper for a company you don’t know well, in an industry you’ve never written about, can be quite a challenge. Writing your fifth white paper for a long-term client in an industry you know is not so difficult. Most writers feel that the first white paper they ever wrote was quite difficult. And many writers who have done fewer than 10 white papers still find it difficult. If you understand the material and work well with others, writing a white paper can be smooth and enjoyable. If not… quite the reverse. All in all, writing a white paper is no harder than writing a major magazine article of several thousand words. But if you’ve never done that before, it may be very difficult indeed. According to the White Paper Writer Industry Report which surveyed 600+ writers in 2007, the typical white paper takes between 24 and 50 hours to complete. That means one to two weeks full-time should be enough to complete a white paper… if everything falls into place. Like any corporate writing project, you must allow time for interviews, research, outlining, drafting and perhaps coming up with diagrams. A client will expect a few progress reports. And you will have to incorporate their comments into your drafts. If you manage this process well, writing a white paper can be smooth and efficient. The more experience a white paper writer has, the faster they tend to work. And freelancers tend to produce faster than in-house or non-professional writers. How much can you charge to write one? In 20113, extensive research for my book White Papers For Dummies showed that the average fee for a text-only white paper was $4,200. Most B2B marketers expect to pay between $5,000 and $7,000 for an experienced white paper writer. Obviously, if you have specialized knowledge about a niche market, you can charge more than a generalist who will need more time and ask more questions to get up to speed. And the more white papers you have written, the more you can generally charge. And an inexperienced designer can destroy the readability of an otherwise strong white paper. Successful white paper writers sooner or later devise ways to deal with these issues. The most effective strategy is to head off these problems before they happen, by planning and managing a white paper to yield the best possible results. 1. Round up approvals from all stakeholders early on. 2. Submit short deliverables for discussion, like a creative brief or a one-page outline, before you start writing a 10-page document. 3. Get your client or company to make a tangible commitment to completing a white paper. For example, freelance writers can get a partial payment in advance; in-house writers can get an okay to forego other duties writing the document. 4. Work closely with the designer and make sure they understand the white paper format. You’re in the right place; this White Paper FAQ is an excellent place to start. This website provides 100+ articles on every aspects of writing white papers. You’re welcome to explore them all. After that, to take part in a forum where white paper writers post and answer related questions, visit my LinkedIn group, called Get More From Your White Papers. This group is by request only and sticks strictly to white papers. And of course, you could always get my book, White Papers For Dummies. I crammed 15 years’ worth of tips and tactics into it. You can see what reviewers are saying about it here or check out the book at Amazon here. Then generalize that knowledge into the vertical markets it touches and the horizontal business functions it involves. Create a persona of your ideal client. Expect to spend 40 hours a week either writing or working on your marketing. Use the phone, not e-mail to contact prospects. Show your ideal client what you can do for them—and if you have to, do it for free the first time. Keep a swipe file of examples and use it to inspire you and your clients. Be passionate about what you do. Then create value for others. Other things you can do are build a web presence and create a “buzz piece”—a white paper of your own to attract leads. Then, once you start writing white papers, publish good samples and testimonials on your website. Some final tips: Never stop marketing and never say you’re too busy to do marketing. And keep doing whatever works for you. For more in-depth information on this topic see my articles: To get clients, learn how to call a moose and Writers: Five strategies for finding white paper clients. I’ve tracked back the earliest ancestors of the white paper to UK government reports from the late 19th century. This term “white paper” arose early in the 20th century in Great Britain. It was used to distinguish shorter government briefs and position papers with white covers from longer reports and policy books with blue covers. I have located white papers from the UK dating back to the late 1890s. I am still searching for the earliest one on file in the UK government archives. One of the earliest white papers many people point to is the so-called Churchill White Paper from 1922. See more background at www.palestinefacts.org. A few months after this was published, Britain apparently broke every promise in it. Just like today, not all white papers speak the truth?! White papers were often used in science and medicine during WWII, the 1950s and 60s. With the rise of the PC in the 80s, white papers started to become extremely popular in the IT industry. And in the 90s, the Web provided an inexpensive distribution channel that sparked today’s ongoing explosion of white papers. One thing’s for sure: The number of white papers is growing exponentially. In 2002, I ran a Google search for the phrase “white papers” that yielded 2.8 million hits. A decade later, in 2012, the same search got 39.5 million hits—14 times as many. And these have been become a standard part of the marketing toolkit in some sectors. That’s because truly effective white papers are highly read and passed on from person to person. They have a major impact on buying decisions for billions of dollars worth of products and services every year. Yet this label is applied indiscriminately to many documents that are not problem/solution white papers. Too many are nothing but thinly veiled sales pitches. For this reason, the term “white paper” is becoming devalued. For the near future, white papers will continue to be very popular with marketers and prospects. Over the longer term, many new formats for delivering information are being explored. video (“explainer videos” or recorded webinars). Others mediums on the horizon, including 3D immersive experiences and virtual trade shows. Although these formats can offer a more engaging experience for certain audiences, they require higher budgets and different production methods. And it’s not useful to call these “white papers” since they are not delivered as text on paper. Those who call some other medium a “white paper” are likely trying to trade off the popularity and impact of these documents.